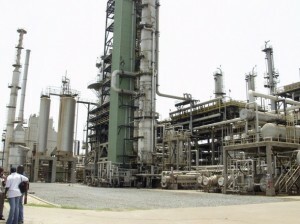 Tema Oil Refinery Ltd., Ghana’s sole crude processor, expects to boost capacity by 33 percent in two years after signing a contract to replace old equipment. The company’s refinery has struggled because of a lack of credit and faulty equipment since 2009, even as growth in West Africa’s second-biggest economy increased demand for fuel. The plant was repeatedly forced to shut, including an eight-month period that only ended in March after the government provided the state-owned plant with $30 million for repairs. It now operates at 60 percent capacity, Ampiah said. The government has yet to pay the second tranche of a $67 million injection needed to retool operations and boost efficiency. “We have made some progress in accessing the remaining funds to continue with the repairs and retooling program,” Ampiah said. Ghana’s gasoline demand rose 43 percent to 993,000 metric tons in the three years to December 2012 and diesel gained 34 percent to 1.3 million tons, the National Petroleum Authority said. Most of the country’s fuel needs are met with imports.